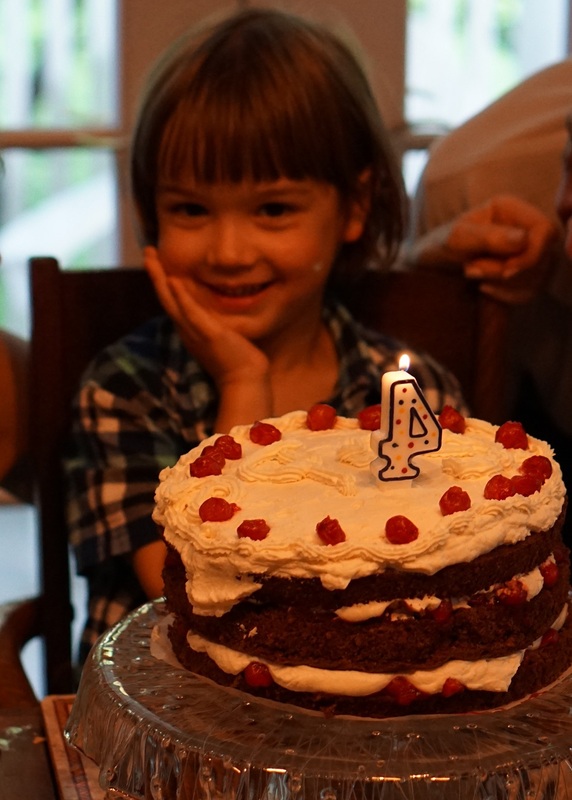 We spent a good chunk of the weekend celebrating Gabriel’s fourth birthday with family and friends. 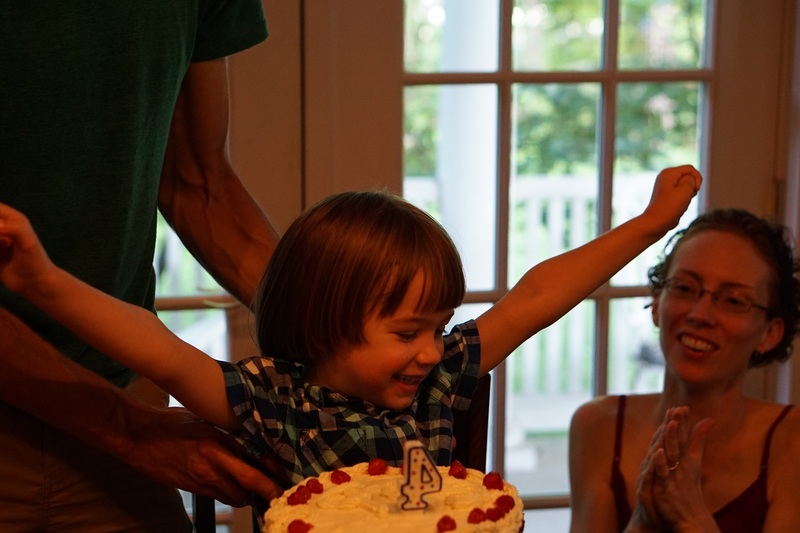 Four is indeed a fun age, as evidenced by his excitement and enthusiasm for [almost] everything. 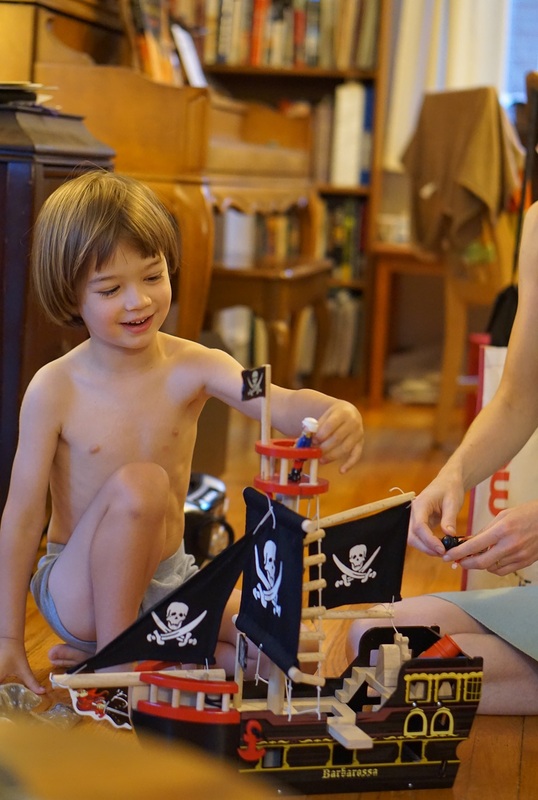 The first present he opened was a pirate ship. This was an unplanned gift — less than two weeks before his birthday, I was searching Craigslist for a pirate costume (he specifically wants a Captain Hook costume). I didn’t find any costumes (not really the right time of year), but I did find someone selling this fabulous wooden pirate ship. It’s in really good condition, and it was quite a steal. G is a big fan! But he was equally elated about the little things, proclaiming, “I LOVE banana chips” as he opened this [bandana-wrapped] present. We met up that night for dinner at Papa and Nana’s house. 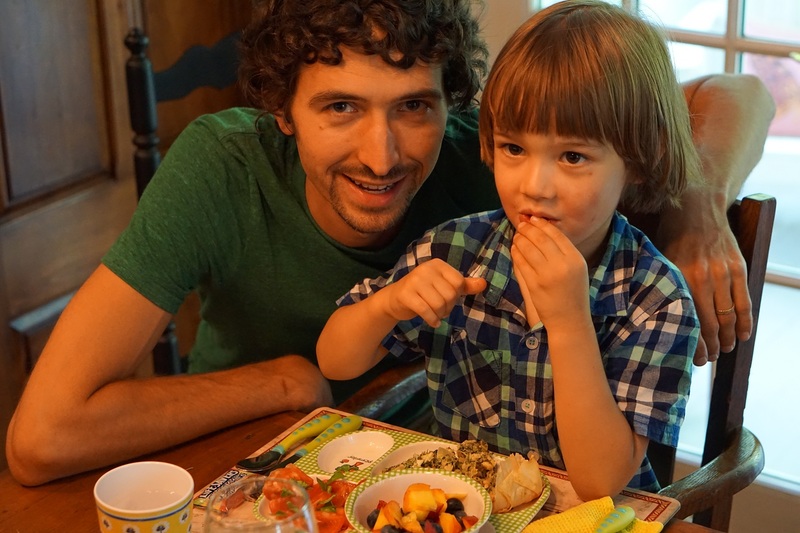 We enjoyed a delicious birthday meal of spanikopita, Caprese salad, and fruit salad. Then is was time for the main event . . .
. . . a homemade (by my FIL) black forest cake! The above picture was a little fuzzy, but I loved his pose. After dinner, we headed over to the fireworks show at Sublette Park. The display is usually closer to the 4th of July, but they also always choose a Saturday night, and I’m guessing they didn’t want to compete with the fireworks on the actual 4th. It worked out well for us though — fireworks on your birthday, what could be better? I tried to help by covering his ears, but he just didn’t look like he was having a good time. I finally asked him if he wanted to stay or leave, and he said leave. 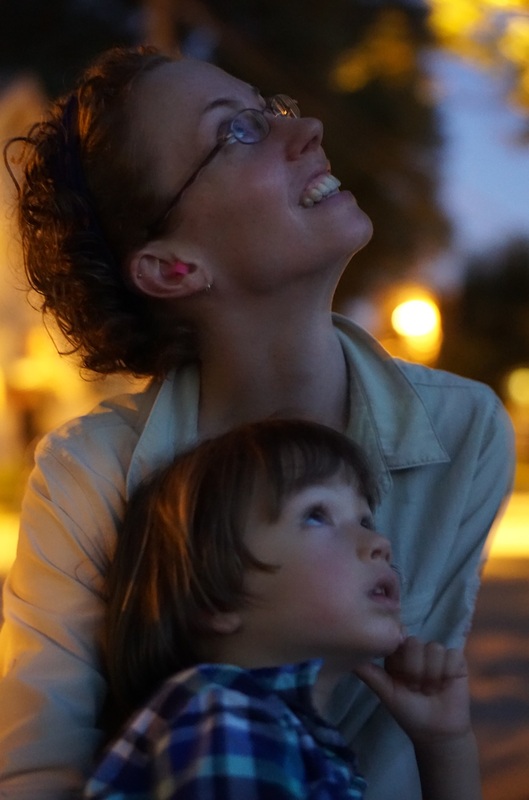 We were parked a couple of blocks away (parking was a mess, and we regretted not biking, but we didn’t have time to go home for the bikes after dinner), and as I carried him to the car, he was able to look back and see some of the show. He seemed much happier in that position. Sunday was “friend party” day. We rented a pavilion at a local park. 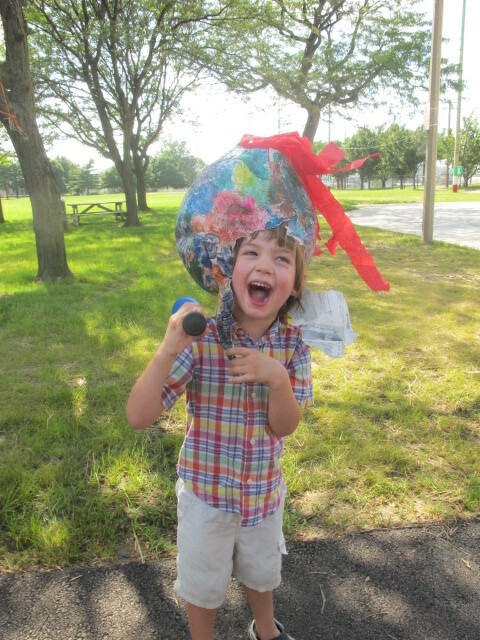 Gabriel and I made a piñata, and I brought musical instruments so the kids could have a parade. Otherwise, we kept things fairly simple (though I wouldn’t mind simplifying further for future years!). 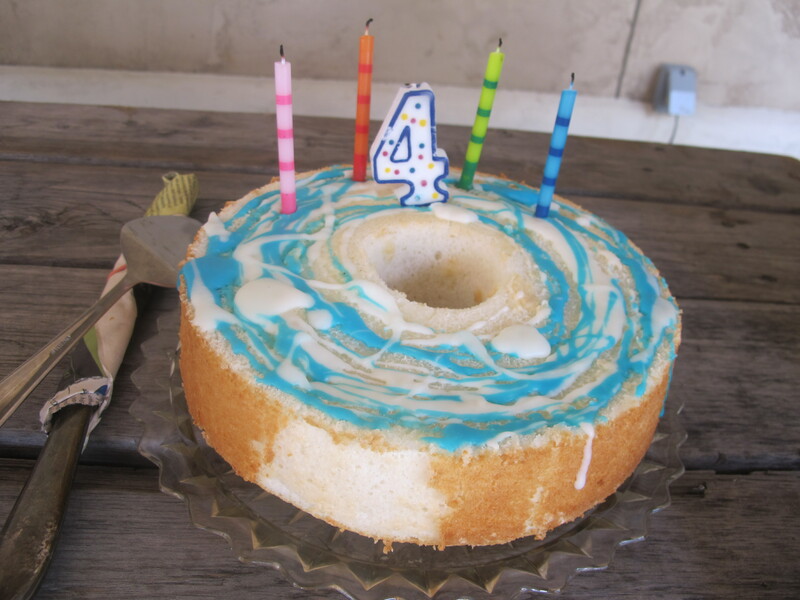 My MIL made angel food cake (“the best angel food cake in the world”), which was G’s special request. After cake, came the piñata. 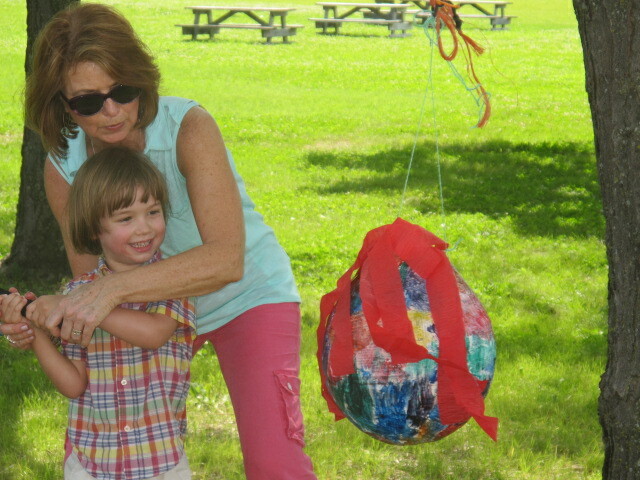 He did have a breakdown when it came time to let his friends have a swing at the piñata, proving that turning four is not a magic pill for such issues, but he recovered fairly quickly. 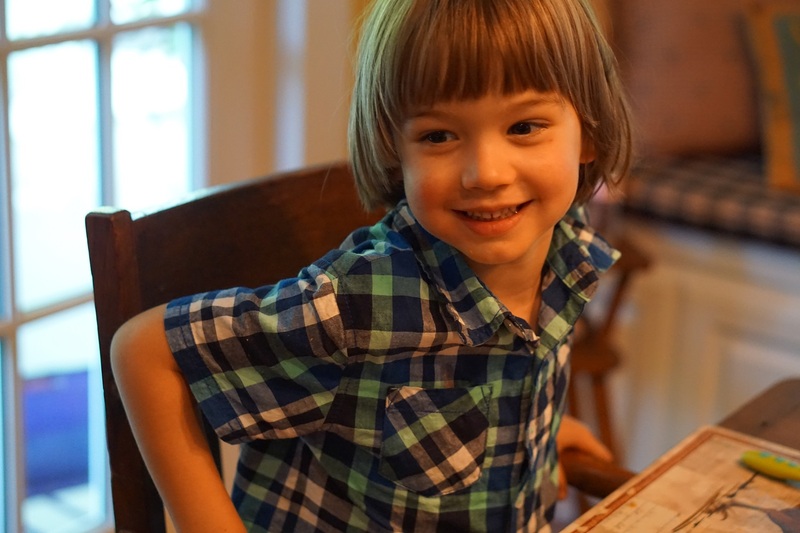 This entry was posted in Cuteness, My Life and tagged parenting. Bookmark the permalink. I don’t have a captain hook costume but I think we may have a variety of pirate costume bits (hats, vests, a hook, and an eye patch). Let me know if you want to borrow or have any. 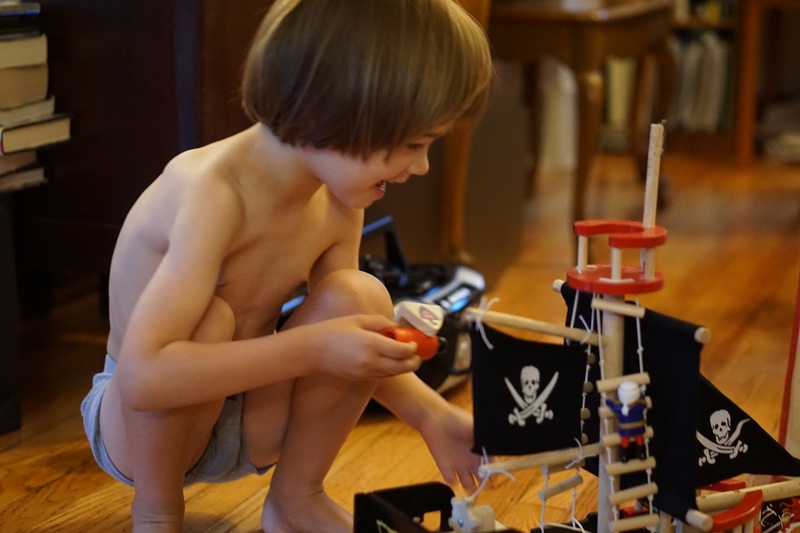 If there’s any pirate costume materials that your boys have outgrown or aren’t using, we would be interested! Otherwise, I’ll check resale shops (and CL) as we get closer to Halloween.